Today we have a problem . . . A problem shared by the cast and crew of a motion picture company in Winnipeg . . . A problem caused by Westjet Cargo. To make matters worse, despite numerous calls to Westjet this morning, NOBODY at Westjet is willing to solve this problem. Instead, everyone we have spoken with has chosen to hide behind the "I am just following procedures" excuse . . . earning them all recognition as having the WORST CUSTOMER SERVICE. At this moment six out of a shipment of seven boxes of production supplies destined for Winnipeg is still sitting on the tarmac in Vancouver waiting for a plane. Yesterday afternoon, we chose Westjet as our carrier because they told us they could get this shipment to Winnipeg overnight. For that GUARANTEED "EXPEDITED" service we agreed to pay thousands of dollars in shipping charges. This morning we were contacted by Westjet and told that only one box made it out on their 6:45 pm flight yesterday. As it turns out, the majority of our shipment was "bumped" by passengers. To make matters worse, they cannot tell us when . . . or even IF . . . our shipment will be delivered to Winnipeg. We have been completely frustrated in all attempts to contact ANY Westjet manager with the authority to ensure that our shipment is expedited. The receptionist and employees of the Westjet sales department have continued to stonewall us . . . they have given us completely incorrect information . . . and have demonstrated a complete lack of concern about the problems, or consequences, that they and their SERIOUSLY FLAWED airline have created. We have been "placed on hold" repeatedly and completely unable to speak with ANYBODY who can help. 2) Conducted a personal conversation with a coworker while at the same time on the phone recording the details of our shipment . . . in her words, when questioned about this, she jokingly replied, "I am multi-tasking"
3) Lied to us. She told us the reason our shipment did not go out was because the boxes were the wrong size. Her supervisor later told us our shipment was bumped by passengers. It should be noted that nobody at Westjet called us to let us know our shipment had not made it out last night as promised. Had we known, we could have made other arrangements and the problem for the picture company could have been averted. Now, making matters even worse, unable to get service or a solution from the sales department, we just called the corporate offices of Westjet in Calgary and asked to speak with the current Westjet CEO, Gregg Saretsky. Judy, the receptionist told us she was unable to find the CEO, or the VP of Operations, or the VP of Sales, or ANY MANAGER in the building. She was also unable to find any "Administrator" in the building. We were put on hold repeatedly, but again the fall back was the "We are a large company and I am only following procedures" excuse. Judy told us that she was in a six story building and could not be expected to know who was in the building. When I told her we would be sharing our experience with Westjet on the Internet, Judy said she felt threatened. Judy said she was "trying". I pointed out that "trying" was not the same as "doing" and I told her that I needed her to actually DO something instead of just trying. Rather than take this problem seriously Judy chose to hang up on us! Nice job of Customer Service Judy. So, given the fact that Judy "the receptionist" was unable to transfer my urgent call to ANY living breathing person in her six story building, I think it is fair to add Judy to the list of incompetent Westjet employees being managed by CEO Gregg Saretsky. Personally, I have been flying since 1953 and have logged untold hundreds of thousands of miles in the air. NEVER have I encountered an airline with worse customer service. I have also shipped baggage and cargo all over the world and have never had a worse airline experience. If you are contemplating using Westjet for your next cargo shipment . . . BEWARE!!! . . . Your cargo will get bumped if they sell too many passenger tickets. Seriously . . . This company should NOT be in the cargo business if they are not willing to service cargo customers properly. According to a previous Westjet CEO, WestJet's Core Value Proposition is "cheap fare, fun environment and good experience when you fly with WestJet." The airline's recipe to attract its clients is "humor, customer service and good value." . . . Well, nobody here is having a good experience, or much fun, today dealing with your airline Mr (former) CEO. Under CEO Gregg Saretsky's management, based on our experience with a number of Westjet employees as we have dealt with while attempting to manage the damage this airline has created, a more appropriate Value Proposition for Westjet employees would be . . . "We are a large company. We follow procedures." This is just the latest example of a company that fails to live up to the founders' Vision and Mission. Mr. Saretsky, you are undoubtedly focused on growing profits, but in the process your corporate culture is in big trouble. This ALWAYS happens when a company puts profits ahead of customer service. The wrong people are hired; employees are not properly trained; Managers lose touch with their customer base; Core Values deteriorate; individual initiative disappears; and Service is replaced by a robotic-like adherence to "policy". Over time, companies on this downward spiral eventually fail and shareholders lose their investments. 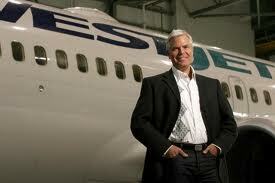 Westjet is a company that was built on individual initiative Mr. Saretsky. You might want to be curious about how the airline has lost touch with its core values. Telling jokes on flights is all well and good, but today's joke is the horrific service on Westjet Cargo, and the "joke" is on all of your customers who expect, and deserve, so much more from your company.